AA6E Station Log: Z100 -> P100! After a little discussion with Jack Smith about the inner workings of his Z100 Tuning Aid (last post), one thing led to another. 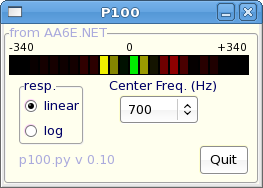 The result is another little Python utility that does much of what the Z100 does, but in software under Linux. The scoop and download are available here.